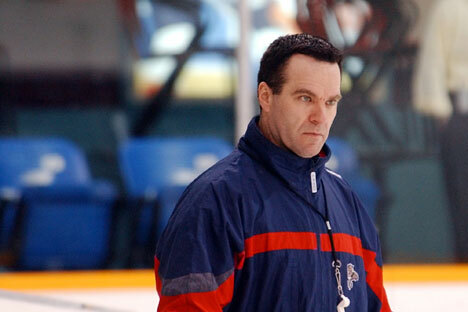 American expert John Torchetti is to become the head coach of the CSKA hockey club. The Star Tribune, the leading paper in Minnesota, has reported John Torchetti’s move to CSKA as a done deal. Official spokespersons for the club have not yet confirmed this information. The Minnesota paper reported that Torchetti had left Iowa Wild after signing a three-year contract with CSKA. As a player, John Torchetti did not reach the NHL level. Nonetheless, as a coach, he has an impressive record. Torchetti’s resume includes time spent as acting head coach for the NHL Florida Panthers and Los Angeles Kings; in 2010, he won the Stanley Cup as an assistant head coach with the Chicago Blackhawks. Last season, Torchetti’s Iowa Wild team was eliminated in the first round of the AHL playoffs. What adds spice to the Moscow club’s call to the American coach is that, in late June, CSKA’s official spokespersons were in no hurry to confirm that the club had issued a registration certificate to Torchetti. Igor Yesmantovich, CSKA’s general director, assured journalists that he knows nothing about Torchetti’s being appointed and has had no contact with Sergei Fedorov on the subject. It is possible that John Torchetti will be officially revealed to the world as CSKA’s coach on July 11, when the club begins its preparations for the new season. The potential move of a hockey coach from North America’s NHL to Russia’s Kontinental Hockey League is not unusual. In May, for example, legendary Canadian coach “Iron” Mike Keenan signed a two-year contract with Metallurg Magnitogorsk. So far, no team headed by a North American coach has won the KHL championship title and the Gagarin Cup. This record includes American coach Barry Smith, who spent three years with SKA St. Petersburg (2007–2010) without winning any trophies.